Police Officer John Saleh of Nassau County’s 3rd Precinct was commended for rescuing and adopting an abandoned German Shepherd mix upon answering a call from a landlord in Roosevelt. Nassau County, NY - September 3, 2015 - Nassau County Executive Edward P. Mangano (3rd left) and Acting Police Commissioner Thomas Krumpter presented a Citation to Police Officer John Saleh of Nassau County’s 3rd Precinct for rescuing and adopting an abandoned German Shepherd mix upon answering a call from a landlord in Roosevelt. The landlord discovered the 1 year old German Shepherd mix had been left in an empty apartment when the prior tenants abruptly moved due to a family emergency. The dog, named Brooklyn, left an impression on Officer Saleh long after his shift had ended and Brooklyn was settled in at his new temporary home in The Town of Hempstead’s Animal Shelter. Officer Saleh found himself checking in on Brooklyn daily, wishing he could adopt the friendly pooch himself, but with a newborn and a 2 year old at home he knew it would be too much for his family. Luckily for Brooklyn Officer Saleh contacted friends and family and made arrangements for his brother-in-law John Upton, and his family to come to The Town of Hempstead Shelter to meet him. Once The Upton family met Brooklyn, there was no turning back from this match made in heaven. John and Kerry Upton with children Matthew, James, Catherine and Joseph fell in love with their new family member upon sight. Brooklyn was a popular dog during his stay at the shelter, but there are still plenty of dogs and cats at the Town of Hempstead Animal Shelter who are also waiting for new homes and loving families. 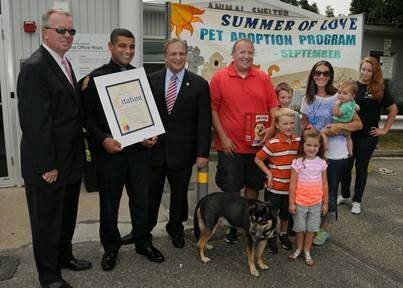 County Executive Mangano encourages you to visit and meet all of them if you are looking for a pet. The shelter is located at 3320 Beltagh Avenue in Wantagh, and information is available 7 days a week at 516-785-5220 or by visiting here. Pictured: (left to right) Acting Police Commissioner Thomas Krumpter, Police Officer John Saleh, Nassau County Executive Ed Mangano, and John & Kerry Upton with children Matthew, James, Catherine, Joseph, and newest family member Brooklyn. Subject: LongIsland.com - Your Name sent you Article details of "Mangano Commends Officer For Rescuing Abandoned Pooch And Finding Him A New Family"